I never had any intention or wanted to get involved in the cookie business. 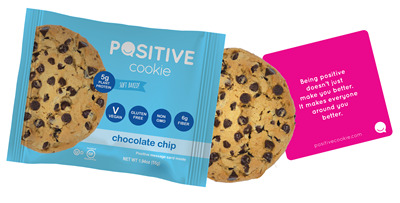 But if you saw the email we sent out last Thursday and follow me on social media we launched the Positive Cookie. I did it because I saw the Positive Cookie as a great way to encourage people. I realized that even though we were going to be making cookies we weren't in the cookie business. We were going to make it our business to encourage as many people as possible, one person, one cookie at a time. You see, inside every wrapper is a great tasting cookie with a food grade laminated card featuring a positive, encouraging message. When deciding to do this I envisioned someone having a tough day, opening the wrapper and being lifted up by the message . My favorite cards are "You are loved" and "The best is yet to come." Since 2002 my mission has been to encourage and inspire as many people as possible one person at a time. It's what wakes me up in the morning and drives me to share this newsletter, write books, speak and develop training to develop positive leaders and teams. I saw the cookie and card as another great way to encourage others and donate money to charity. The good news is that we are off to a great start thanks to so many of you who joined the launch team this week! 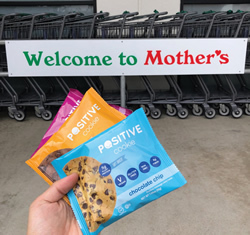 We also just launched in our first stores, Mother's Market and Kitchen in Southern California and hopefully Whole Foods, HEB, Kroger and others in the future. I appreciate all your help!! Thank you!! I want to be transparent and let you know that this venture has not been easy. Launching a new business has provided me with a lot of new material to write about and share. In this spirit I wanted to share 9 lessons I've learned so far starting a new venture. 1. Leadership is Hard - It's easy to write about the principles. Implementing them is challenging. It takes time, energy, commitment and discipline. 2. Get Clear on Your Why - Before you do something get clear on why you are doing it. If it fits with your mission you know you are on the right track. 3. Know What Business You're Really In - Whatever business you are in get clear on what business you are really in. For example, Starbucks sells coffee but Howard Schultz has said, "We are not in the coffee business serving people, but in the people business serving coffee." 4. Stick to Your Core - Only do something if it fits with your core mission. If you extend, make sure you extend from the core. 5. Get the Right People on the Bus - Pat Riley said, "You don’t have to yell at someone who wants the same things as you do." 6. Build a Team Whose Strengths Compliment Your Weaknesses - I'm not great with operations and have no idea on how to make cookies so I have partners who are great in those areas. 7. Expect Challenges - There were so many times I didn't think we would make it. I had to laugh that we were launching a positive cookie and dealing with so much negativity. But that's life. You must expect challenges and have an even greater expectation that you will overcome them. 8. Have a Lot of Conversations about Everything - We had to make a lot of decisions about a lot of things. To make our decision we had a lot of conversations about big things and small details. Ultimately these conversations led to clarity, focus and a product we feel great about. 9. Every Challenge is an Opportunity - Every delay helped us make better decisions. Every mistake made us better. Every time someone said it couldn't be done we found a way to do it. When you are creating a unique product that no one had figured out how to do before you will have challenges but in those challenges are big opportunities to grow and do something special. or bring our team to your organization for an on-site training! 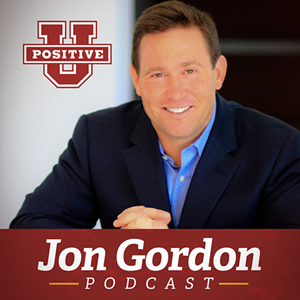 Each week Jon shares an insightful interview with the best of the best to help you discover their strategies for staying positive, overcoming challenges and making a greater difference. Subscribe via iTunes, Stitcher and Google Play. a short 1-2 minute encouraging message from Jon.